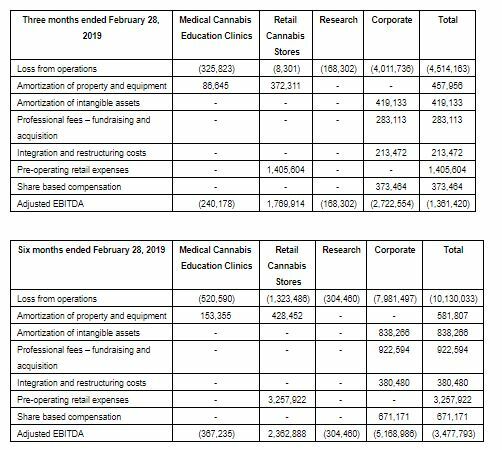 National Access Cannabis Generates $16.2 million in Revenue in Q2 2019. Retail Cannabis Stores Generate $15.9 million in Revenue and Adjusted EBITDA of $1.8 million. The Company has generated over $27 million in cumulative recreational cannabis sales since legalization on October 17, 2018, with an average gross margin of over 31%. Q2-2019 total revenue of $16.2 million represents a 328% increase versus prior quarter total revenue. 23 retail cannabis stores open at the end of Q2-2019. The Company expects to have 40 stores open and operating by the end of calendar 2019. 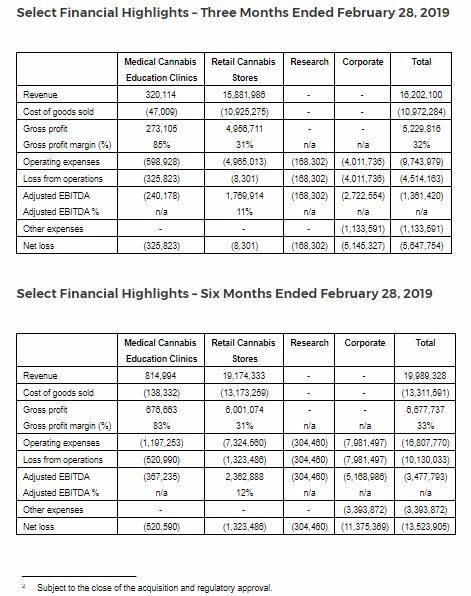 TORONTO, April 16, 2019 /CNW/ – National Access Cannabis Corp. (“NAC” or the “Company”) (TSXV: META), the largest private retailer of recreational cannabis in Canada, today announced its financial results for the second quarter ended February 28, 2019. All amounts are expressed in Canadian dollars. With 23 stores operating in two provinces, seven applications underway in B.C. and a focused strategy for Ontario, we are poised to continue growing our leading footprint at a national level, while driving solid financial performance for our shareholders. I am very proud of our team’s operational execution, which has resulted in our retail cannabis operating business unit generating consistently strong revenue growth and positive Adjusted EBITDA. Our team is focused on accretively building our national retail footprint to 40 stores by the end of calendar 2019, while maximizing the same-store sales growth and contribution of individual store locations. As the Canadian cannabis market finds its footing, we also expect supply issues to begin to abate, which will enable us to continue offering our customers the wide selection they are used to, while optimizing our working capital and Adjusted EBITDA for the benefit of shareholders. This press release should be read in conjunction with the unaudited condensed interim consolidated financial statements and accompanying notes for the three and six months ended February 28, 2019 and the related Interim MD&A – Quarterly Highlights for the three and six-month period ended February 28, 2019. 1Adjusted EBITDA is a non-IFRS measure that does not have a standardized meaning prescribed by IFRS. For more information and a reconciliation of non-IFRS measures to the closest IFRS measure, see below under “Financial Measures”, or find additional detail in the “Non-IFRS Financial Measures” section in the Company’s Interim MD&A – Quarterly Highlights for the three and six-month period ended February 28, 2019, available on SEDAR and on the Company’s website. The Company currently operates 23 recreational cannabis retail stores, 14 in Alberta and 9 in Manitoba. 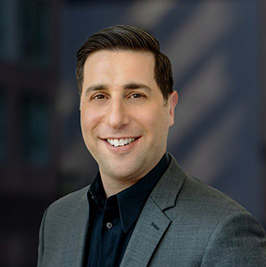 Announced the appointment of Michael Cosic as Chief Financial Officer and Lori Bailey as Senior Vice-President of Retail. The Company entered into a share purchase agreement with the shareholders of New Leaf Emporium, which will enable NAC to expand into Saskatchewan through an operating Moose Jaw location, and an e-commerce license2. Entered into a six-month $9,000,000 loan agreement with Opaskwayak Cree Nation; carrying an interest rate of 8% per annum. Acquired all of NAC Alberta Inc.’s minority interest in NAC Northern Alberta GP and NAC Northern Alberta Limited Partnership, giving NAC 100% ownership of various leaseholds, and rights to operate retail locations in Northern Alberta. There are measures included in this news release that do not have a standardized meaning prescribed by IFRS and therefore may not be comparable to similarly titled measures and metrics presented by other publicly traded companies. The Company includes these measures because it believes certain investors use these measures and metrics as a means of assessing financial performance. EBITDA (earnings before interest, taxes, depreciation and amortization) is a non-IFRS financial measure that does not have any standardized meaning prescribed by IFRS and may not be comparable to similar measures presented by other companies. Management defines Adjusted EBITDA as the net loss from operations, as reported, before interest, tax, and adjusted by removing non-cash items, including stock-based compensation expense, depreciation, and further adjusted to remove integration and restructuring related costs, as well as upfront costs required to open a retail store. Management believes Adjusted EBITDA is a useful financial metric to assess its operating performance on a cash adjusted basis before the impact of non-cash items and acquisition related costs. Adjusted EBITDA is a non-IFRS financial measure that does not have any standardized meaning and therefore may not be comparable to similar measures presented by other issuers. The Company today announced that National Access Canada Corporation (“NACC”), a subsidiary of NAC, has entered into an agreement with Kyle Wilson, pursuant to which NACC has agreed to issue common shares of the Company to Kyle Wilson in exchange for consulting services previously rendered by Kyle Wilson. Pursuant to the terms of the agreement, NACC will pay a total fee of $82,800, to be paid by way of common shares of the Company. Pursuant to TSX Venture Exchange Policy 4.3 – Shares for Debt, the deemed price of the securities to be issued is $0.92, being the Market Price (as such term is defined in the policies of the TSX Venture Exchange) of the common shares of the Company on the last trading day before the date of the agreement. The issuance of common shares to Kyle Wilson is subject to approval of the TSX Venture Exchange. The Company has granted stock options to purchase an aggregate of 500,000 common shares of the Company to an officer of NAC. The stock options have an exercise price of $0.92 per common share and expire four years from the date of grant. One-fifth of the options granted vest six months following the date of the grant, with the remainder of the options vesting over the course of four installments, each installment vesting every three months thereafter. NAC is Canada’s largest recreational cannabis retailer. With 23 retail locations nationwide, NAC is the leader in secure, safe and responsible access to legal recreational cannabis in Canada. Through its Canada-wide network of Meta Cannabis Supply Co.™ and NewLeaf Cannabis™ recreational cannabis retail stores and NAC Medical’s cannabis clinics and pharmacy partnerships, NAC enables the public and registered patients to gain knowledgeable access to Canada’snetwork of authorized Licensed Producers of cannabis. NAC is listed on the TSX Venture Exchange under the symbol (TSXV: META).